Create a small work station in any room of your house with this unique Petite Computer Armoire Desk. 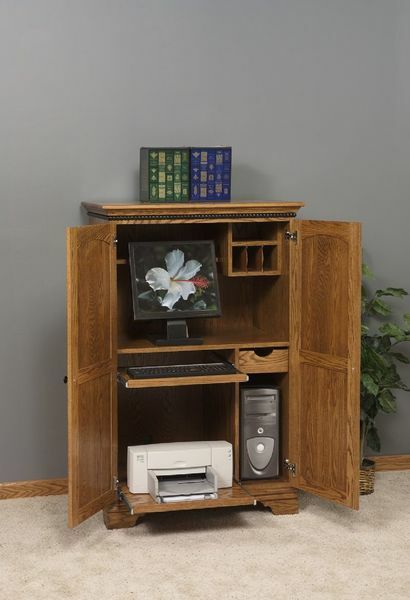 This skillfully crafted piece of Amish office furniture can transform from a standard storage cabinet into an all-in-one work station by simply opening the front doors. Get your order started today and enjoy the quality of Amish handcrafted furniture first hand. Thank you for this. The armoire arrived on Monday and is extremely well made. The requested customizations were done very nicely. The woodworker clearly understood the philosophy of making this piece similar to the stereo cabinet and extended it gracefully and thoughtfully where necessary.